Edward Jim Orgeron Jr. (born July 27, 1961) is an American football coach and is currently the head coach at Louisiana State University (LSU). 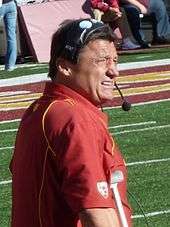 Orgeron served as the head football coach at University of Mississippi (Ole Miss) from 2005 to 2007 and was the interim head coach at the University of Southern California (USC) in 2013. His nickname is "Coach O". Born to Edward "Bé Bé" Orgeron Sr. (d. 2011) and Cornelia "Co Co" Orgeron, Ed and his brother Steve grew up in Larose, a town on the Bayou Lafourche in Lafourche Parish, Louisiana. He is of Cajun descent. Orgeron attended South Lafourche High School in Galliano, Louisiana with former Michigan Panthers, New Orleans Saints, and Atlanta Falcons quarterback Bobby Hebert. Orgeron and Hebert played on the school's Class 4A state championship team in 1977. Orgeron signed to play football at Louisiana State University, but left the program after his first year to transfer to Northwestern State University in Natchitoches, Louisiana. Orgeron began coaching in 1984 as a graduate assistant at Northwestern State and the following year coached at McNeese State in Lake Charles, Louisiana. He then served two years as an assistant strength coach under Ken Hatfield at the University of Arkansas. In 1988 he began his tenure with the University of Miami, under then-head coach Jimmy Johnson and his successor, Dennis Erickson. He was their Defensive Line Coach for four of those years, in which he coached eight All-Americans (including NFL first-round draft choices Cortez Kennedy, Russell Maryland and Warren Sapp). While he was with the Hurricanes, the program won two national championships (in 1989 and 1991), and he recruited a young Dwayne Johnson (later known as "The Rock" in his professional wrestling and film careers) as a defensive lineman. — Ed Orgeron on his 1992 dismissal by Miami. Starting in 1991, a series of personal problems began to surface for Orgeron: a local woman filed a restraining order against Orgeron, accusing him of repeatedly attacking her. In July 1992, Orgeron was arrested for his part in a bar fight in Baton Rouge, Louisiana; Orgeron acknowledged he had been intoxicated that night and had grown angry when not allowed back inside to retrieve his credit card. In October 1992, Orgeron took a leave of absence from the University of Miami coaching staff for personal reasons; the departure turned out to be a permanent one, however, and he was replaced by assistant coach Randy Shannon. Taking a respite from coaching, Orgeron worked on his personal life: the permanent injunction against him was eventually rescinded, and the felony second-degree battery charges he faced were dropped. He stayed with his parents in Larose, crediting his father for helping him get his life in order. Orgeron returned to coaching in 1994, but as a volunteer linebackers coach at Nicholls State University. The following year, he moved from the south to the northeastern U.S., accepting a job with head coach Paul Pasqualoni's staff at Syracuse University, where he coached defensive line for three years. Orgeron credited Pasqualoni for giving him a second chance at major-college coaching (after his prior personal issues had damaged his 'hireability'), and, helping him develop as a coach on- and off-the-field. In 1998, he was hired by offensive guru Paul Hackett, the newly hired head coach of USC (the University of Southern California), to coach the Trojans defensive line. After Hackett's 2000 firing, Orgeron was one of a handful of coaches retained by Hackett's replacement, Pete Carroll, a defensive specialist. The two had met during a high school football game when Carroll was still only a candidate for the head coach position, and connected over their shared passion for recruiting. During the Carroll years, USC enjoyed much success, including two (Associated Press) National Championships. Orgeron took on the added responsibility of Recruiting Coordinator in 2001, and was named assistant head coach in 2003. Orgeron won National Recruiter of the Year honors in 2004, the same year he was hired by Ole Miss to replace head coach David Cutcliffe. Upon arriving at Ole Miss , Orgeron attempted to bring USC's passing game coordinator, Lane Kiffin, with him as the new offensive coordinator, but Kiffin opted to stay with the Trojans. Entering the 2005 season, Orgeron had hoped to bring a USC-style offense to the Southeastern Conference (SEC), but found limited success. The University of Mississippi's offense finished the season ranked 111th out of 117 Division I-A schools, in total offense; 115th in scoring; and, 116th in rushing. Orgeron's defensive experience, along with returning linebacker Patrick Willis, helped the Rebel defense in 2005, but as a result of the offensive woes, the 2005 team struggled and finished the season with a record of three wins and eight losses—the Rebels' worst record since 1987. In response to the results of his first season, Orgeron fired offensive coordinator Noel Mazzone, replacing him with former University of Miami offensive coordinator Dan Werner. Also, Orgeron hired Art Kehoe, the longtime offensive line coach at the University of Miami; both assistants had just been fired by the University of Miami. In 2006, Ole' Miss finished the season ranked #108 in scoring offense, #111 in total offense, and #112 in passing offense. Orgeron's second recruiting class in February 2006 was successful, acquiring the written pledges of a national Top 15 signing class. He followed that with the 32nd ranked recruiting class in February 2007. At Ole Miss, Orgeron recorded only two wins against teams with winning records (the 2005 and 2007 Memphis teams, which both finished at 7-5)—the fewest among active SEC coaches at the time. Until the 2007 season, he enjoyed the public support of The University of Mississippi's chancellor Robert Khayat and other administrators with oversight of the football program, including Athletic Director Pete Boone. In a November 2006 article in The Clarion-Ledger, Khayat said of Orgeron and the poor win/loss record since he was hired (7–14, at the time of the interview), "I think Coach Orgeron inherited a very difficult situation....I am 100 percent behind him, and I think that people ought to understand that he has a big challenge." In 2007, Ole' Miss finished the season 0–8 against fellow SEC teams, and 3–9 overall. It was the program's first winless (conference) season since 1982. On November 24, 2007, after Ole Miss blew a 14-point fourth-quarter lead to in-state rival Mississippi State in the season finale, Orgeron was fired. He was replaced by former University of Arkansas head coach Houston Nutt (who had resigned from the Arkansas program three days after Orgeron's firing). On January 23, 2008 it was announced that Orgeron had been hired as the new defensive line coach of the National Football League's New Orleans Saints. On December 31, 2008, Orgeron accepted a position with the University of Tennessee under its new head coach: former USC assistant-coach colleague Lane Kiffin. He worked as associate head coach, recruiting coordinator, and defensive line coach. Orgeron returned to USC's assistant coaching staff on January 12, 2010, after Kiffin resigned from the University of Tennessee without notice to accept the USC head coach position vacated by Pete Carroll (who had returned to head coaching in the NFL). Orgeron was one of the highest paid assistant coaches in the Pac-12 Conference, with an annual salary of $650,000. It was announced on September 29, 2013—after Lane Kiffin's firing—that Orgeron would be the interim head coach of the Trojans for the rest of the 2013 season, until athletic director Pat Haden found a permanent replacement. After his experience at the Ole Miss, Orgeron decided to approach his second stint as a head coach differently. Instead of resuming the intense aggressiveness he had used as a defensive line and head coach, he used a different approach this time. Orgeron applied behavioral techniques he had used on his own teenage children, in an effort to approach his USC players "like my sons". After receiving much praise for their upset win at home over highly ranked Stanford, the Trojans suffered a humiliating, 35–14 defeat to cross-town-rivals UCLA—for the second year in a row—on November 30, 2013. This greatly threatened Orgeron's chances of winning the permanent head coach position. The Trojans were 6–2 under Orgeron, finishing the regular season with a 9–4 record. On December 2, 2013, ESPN reported that another former USC assistant coach under Pete Carroll—Washington head coach Steve Sarkisian—had accepted USC's offer to become the next Trojans head coach. After Orgeron was passed over for the job, he resigned. On January 14, 2015, Orgeron was hired as the defensive line coach at Louisiana State University (LSU). On September 25, 2016, after LSU head coach Les Miles was fired, Orgeron was named the team's interim head coach. On November 26, 2016, Orgeron was named head coach of LSU after going 5-2 as the interim head coach. Orgeron appears as himself in the 2009 film The Blind Side as Mississippi's head coach, recruiting Michael Oher. In 2005, Orgeron had won an intense recruiting battle for Oher. Director John Lee Hancock contacted Orgeron about playing himself, despite having been fired by Ole Miss prior to the filming of the movie; Orgeron agreed and impressed the filmmaker with his enthusiasm. In 2006, Bruce Feldman, then a senior writer at ESPN The Magazine, was allowed in-depth access to the Ole Miss program for a book about the recruiting process at a big-time college football program. The result was 2007's Meat Market: Inside the Smash-Mouth World of College Football Recruiting, a book filled with anecdotes about Orgeron, which The New York Times described as "one of the most insightful books ever written about college football." Orgeron is known for his strong, gravelly voice, Cajun accent, and intensity while coaching. In 2006, during his time at Ole Miss, he was parodied in an internet video titled "Colonel Reb is Cryin'". Orgeron was previously married to Colleen Orgeron. He met his second wife, Kelly, at the 1996 Liberty Bowl and the couple have three boys. Upon returning to USC in 2010, Orgeron lived in a hotel across the street from the campus while his wife and children made their home in Louisiana. ↑ "Orgeron to finalize deal with Rebels". ESPN. December 15, 2004. Retrieved September 29, 2013. 1 2 "Edward Orgeron". Houma Courier. October 18, 2011. Retrieved September 29, 2013. ↑ "Ed Orgeron". USC Trojans. Retrieved September 29, 2013. ↑ Dan Friedell, How good was The Rock at football?, ESPN The Magazine, December 12, 2012, accessed October 2, 2013. 1 2 3 4 5 6 7 Randy Mell, After Um, Orgeron Turned Life Around, Sun-Sentinel, December 31, 2004, accessed September 29, 2013. 1 2 Randy Mell, Defensive Line Coach Gets Leave Of Absence, Sun-Sentinel, October 27, 1992, accessed September 29, 2013. 1 2 3 4 Bud Poliquin, Poliquin: Ed Orgeron, the former Syracuse football aide, will long admire his old boss, Paul Pasqualoni, The Post-Standard, September 15, 2011, accessed September 29, 2013. 1 2 David Wharton, USC's Ed Orgeron is a rah-rah recruiter, Los Angeles Times, February 1, 2011, accessed September 29, 2013. 1 2 Gene Wojciechowski, USC coaching hire gets complicated, ESPN.com, November 13, 2013, accessed November 19, 2013. ↑ Bruce Feldman (2008-12-31). "Orgeron accepts associate head coach job at Tennessee". ESPN.com. Retrieved 2009-01-01. ↑ "USC tabs Ed Orgeron as interim coach after Kiffin fired". USA Today. September 29, 2013. Retrieved 29 September 2013. ↑ Dan Wolken, , USA Today, November 7, 2013, accessed November 19, 2013. ↑ "Sources: USC hires Steve Sarkisian". ESPN. December 2, 2013. ↑ Transcript (3 December 2013). "USC Head Football Coach Steve Sarkisian Introductory Press Conference". Quotes from athletic director Pat Haden. USC Athletic Dept. Retrieved 14 December 2013. ↑ Kleinpeter, Jim. LSU adding Ed Orgeron to football coaching staff. nola.com. January 14, 2015. Retrieved September 25, 2016. ↑ Dellenger, Ross. Sources: Coach Les Miles, offensive coordinator Cam Cameron out at LSU; Ed Orgeron to be interim coach. The Advocate. September 25, 2016. Retrieved September 25, 2016. ↑ Schlabach, Mark (June 29, 2009). "Prominent coaches turn actors for film". ESPN. Retrieved July 1, 2009. ↑ Pete Thamel, Book Review: Meat Market, The New York Times, November 6, 2007, accessed September 29, 2013. ↑ Glenn Guilbeau, Ole Miss coach shows his sense of humor, Shreveport Times, November 16, 2006, accessed September 29, 2013. ↑ Klein, Gary (September 30, 2013). "Ed Orgeron is ready for his leading role as USC's interim coach". Los Angeles Times.